Ok so this year it’s your turn to host Christmas. It’s all arranged, the family are coming to stay. It will be great fun to have everyone together at the most wonderful time of the year, and hopefully everyone will have a brilliant time. The only downside to the situation is that Christmas costs money. Many of us are struggling anyway to make ends meet from month to month. Throw into the equation all the extra expenditure that Christmas brings and we worry that it could mean we’re up to our ears in debt by January. If you spend time planning your Christmas menus and then organising your shopping you can save a lot of money. Because what most of us do is leave everything to the past minute then rush round like rabbits caught in headlights throwing everything into our trolley! Much of which then gets wasted because we never needed it in the first place. So plan your menus carefully. If you are having turkey it can end up more economical to buy a large bird if you know you will use the leftover meat creatively. If you usually end up throwing away the leftovers a week or two later then get small one instead. Either way, you will probably find that buying a whole turkey is more economical than a turkey crown, which always seem to be overpriced. There are often good deals on frozen turkeys, or you may want to consider chicken as a very acceptable replacement. But do plan the meals that you will be having over the Christmas period, so that you then just buy the food items that you actually need. If you enjoy cooking and baking it can be cheaper to make some of the food yourself, particularly if you can club together with friends and either share ingredients or cook for each other. Items like Christmas cake and Christmas pudding can be made well in advance. They use some of the same ingredients so you and a friend could bulk buy then perhaps one of you make two cakes and the other two puddings. Mince pies are cheap to make as well, particularly if – like most of us – you already have bits and pieces in your cupboards such as jars of mincemeat, unused spices or long-forgotten packs of dried fruit. So have a hunt around and give it a try. If you know that you will be having guests to stay over Christmas it’s a good idea to plan early so that you have everything you need. You may find that you need more items like extra bedding or towels, and will then have plenty of time to get these things at good prices rather than a last minute rush to wherever is open. Also consider asking guests to bring their own bedding and towels. Most people would not mind at all, and it would save you not only having to buy these items but the laundry costs afterwards. Now is also a good time to start doing some decluttering and deep-cleaning of your home so that you are not in a last-minute rush. And if you start having a go at cleaning that oven now, it will save you having to pay someone else full price to do it just before Christmas! When planning your food shopping it is worth thinking very carefully about portion sizes. Most of us serve far too much at Christmas and end up with a lot of waste. So do your best to avoid doing too much food – but on the other hand you want to make sure that there is enough for everyone. The BBC Good Food website has a helpful guide to Christmas portion sizes which may help you to plan effectively and buy the right amount of food. Also on the topic of food shopping it is a good idea to buy as much as you can in advance. So every week from now until Christmas try to buy a few of the non-perishable items like canned, dried and frozen goods. You may also be able to prepare some Christmas food in advance – for example gravy, stuffing or some desserts – and freeze it. The more you can do in advance, the more you spread the cost and the less rushing around you will have to do when Christmas comes. If you follow the above steps you will find that there is much less last-minute food shopping to do. Which is great, because this means you can avoid the big supermarket frenzy, where it’s so easy to overspend on things you don’t really need. When it does come to the last minute shop you should know exactly what you need and where is the best place to go for it, rather than being panicked into over-buying. As well as avoiding the last minute big shop, careful planning enables you to shop around for the best deals. 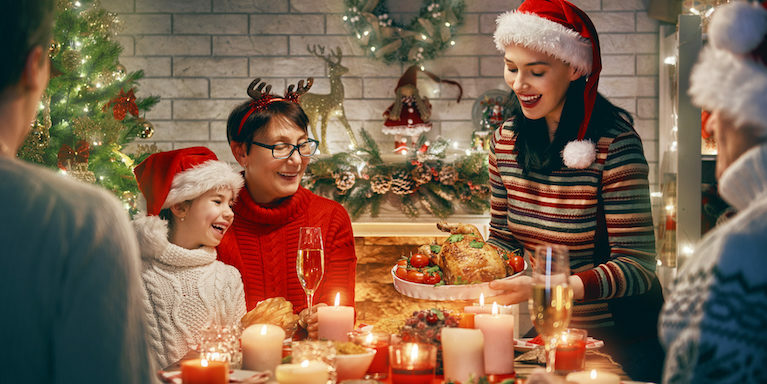 Many stores and supermarkets have a variety of different offers and discounts in the run up to Christmas, so with a bit of planning you can rotate round several stores and get the best deals from each. Also take a look at online companies such as Riverford who deliver vegetable boxes. You may be able to get a box of assorted fresh seasonal produce, with free delivery. There may also be introductory offers. So definitely worth a browse through different websites to see if there is a good value combination that works for you. It can often seem too much effort to bother with vouchers but it is well worth it. Vouchers can save you a lot of money at any time of the year but can be particularly helpful at Christmas. So if you have any vouchers stuffed in your wallet or purse, now is the time to get them out. Also check if you have any gift vouchers lying around that have not been used. You can either use these to help with Christmas shopping or can sell them online on sites such as Zeek. Also make use of any supermarket loyalty points that have built up over the year. It’s a really good idea to let these accumulate during the year then cash them all in at Christmas. Some schemes also give you the opportunity to replace lost points online, so check out the websites of stores that you use. For more general shopping – such as household items – check out voucher sites and cashback sites. Voucher sites – such as Groupon – often have good deals on the items that you may be looking for. Cashback sites – such as Quidco – will pay you money when you use them as part of an online purchase. It can be really expensive buying drinks for the festive season. When we are hosting we try to cater for every possible thing that people would like. But these days there is so much choice that it is simply impossible to have everything. The best thing to do is to keep it simple. Have a simple choice of wines, beers and soft drinks, and ask everyone else to bring their drink of choice. It really is the only way to please everyone whilst keeping your costs down. Again, if you buy your drink bit by bit, a couple of bottles a week, you can spread the cost over a period of time instead of facing a last minute splurge. Last but not least, make this the Christmas when you say yes to everything. The people who are coming will most probably ask “can we bring anything” and our instinct is to be polite and say no. But this year say yes! We have already mentioned asking them to bring their favourite drink, but ask for something else as well, for example crackers, a dessert or cheese board, chocolates or party games. No-one will mind – in fact many guests will enjoy feeling more involved – and it will help to spread the cost. We hope that these money saving enable you to have a wonderful Christmas without breaking the bank. But remember that if you do need some additional funding then Loans 2 Go may be able to help: you can either apply online, call us on 0330 400 0403 or get in touch via our contact form today!